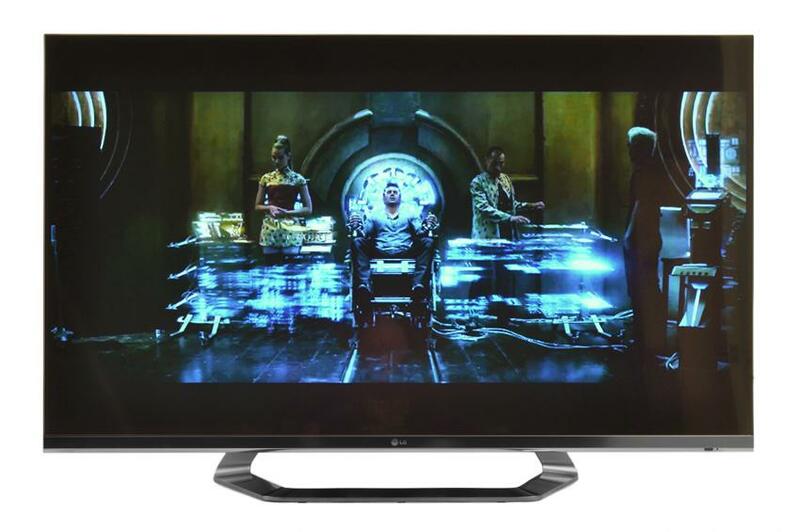 LG LM6700 series information: This review is based on our hands-on experience with the 55-inch LG 55LM6700 TV. However, our observations also apply to the 47-inch 47LM6700. According to LG, the two sets differ only in dimension and weight and offer identical features and performance. Last year Samsung put LG on notice as it introduced its D8000 series of 3D edge-lit LED TVs. We reviewed the UN55D8000 and found its near-absence of bezel appropriately stunning, but were a little disappointed by some inconsistencies in the set’s brightness and some rather obvious bleeding of light at the (almost non-existent) edges. LG has now answered back with the introduction of its new Cinema Screen line of TV’s. Sporting a bezel thickness of just 5mm, the four models in the line just barely manage to “edge out” Samsung by a mere .003 inches. As cool as that may be, the TV has to do a lot more than look pretty while mounted on the wall in order to get a good rating from us. Does the 55LM6700 manage excel where Samsung’s model fell a little short? How about the passive 3D performance and ease-of-use considerations? Read on to find out how this new set from LG fared during our evaluation. We get nervous at the thought of an expensive display making a cross-country voyage in the hands of one of the nation’s big shippers. Unless packed in an anvil case, the risk for panel breakage is high. In fact, we’ve seen plenty of review samples arrive at our offices in a sad and shattered state. Yet, online TV purchases are on the rise, putting more and more of these expensive panels at high risk. Fortunately, the packing job LG has given the 55LM6700 is both well-conceived and effective. Our sample arrived all sealed up in a Styrofoam cocoon with the included stand components sealed off in their own compartments and the left and right edges of the display lined with protective rubber strips. We give LG an A+ for spending a few extra cents on some effective packing materials, even if we do hate EPS Styrofoam and the horrendous mess it tends to make. The TV measures 48.5 x 28.5 x 1.3 inches (width x height x depth) without the stand and weighs in at 47 lbs. Adding the stand tacks on an additional 12 inches in depth and 8 lbs. In the box along with the display we found the TV’s stand, six pair of passive 3D glasses, LG’s magic motion remote control, batteries for the remote, A/V and Component breakout cables and a product manual. Voice command- While the LM6700 does come with LG’s three-mode Magic Motion remote, you’d need to step up to either the LM8600 or LM9600 to get the four-mode version which incorporates voice-control. We don’t consider the lack of voice control a loss. TruMotion 240Hz- The LM6700 is the only model in the cinema screen line that doesn’t offer 240Hz motion smoothing and we consider that a good thing. We aren’t big fans artificial motion interpolation (save, perhaps for gaming) and, as a rule, turn it off during our evaluations anyway. Contrast ratios- The LM6700 has a rated “dynamic” contrast ratio of 8,000,0000:1 whereas the step up models boast bigger numbers. Something tells us that the real world performance of all but the flagship LM9600 is exactly the same. No full-array local dimming- All of the cinema screen models boast locally dimmed LED edge-lighting. Only the LM9600 offers full-array local dimming for precise control of the backlight across the entire panel. No 60-inch model- If you want more than 55-inches of nearly-edgeless TV from LG, you need to go straight to the top-of-the-line. Only the LM9600 is available in a 60-inch size. Let’s now run through some of the more unique features the LM6700 has to offer. For the sake of brevity, we’re going to skip over some of the more mundane stuff (like the number of HDMI inputs) but if you’re jonesin’ for some specs, visit LG’s LM6700 page. Passive 3D with six pair of glasses included — LG already figured out that passive 3D is the superior of the two popular formats in almost every way. Now they’ve apparently figured out that if 3D TV is ever going to take off, offering enough 3D glasses that a whole family (or at least more than one friend) can watch would be a big help, too. 3D depth control — We love this idea. LG provides two adjustments to manage the intensity of the 3D effect. In theory, this could reduce some headaches and crossed eyes. Full screen 3D for two players simultaneously — This approach worked well for Sony’s PlayStation 3D Display and we can imagine it working well here, too. The idea is to eliminate split-screens in multiplayer games by using 3D technology to expose a separate, full-screen image to both players. Unfortunately, this feature requires special 3D glasses not included with the LM6700 and not sent to us for review, so we can’t evaluate its performance. Magic Motion remote — This remote bucks rows of buttons in favor of an interactive point-and-click approach; it’s similar to Nintendo’s Wii gaming system. The remote does offer a mouse-like scroll-wheel, a directional pad and some basic controls for things like volume and channel, but is clearly designed to be used with LG’s point-and-click-friendly user interface. LG Smart TV — Includes access to popular Internet apps like Pandora, Hulu Plus and Vudu plus hundreds of other apps (both free and paid) for a rich content experience. This model also includes a full Web browser with HTML 5 and Flash support, which is more than can be said for the iPhone and iPad. Built-in Wi-Fi — Kind of expected at this price point, but good to see nonetheless. Resolution upscaler — Takes low resolution video and picture sources and upscales them to look better on the high resolution display. ISFccc calibration — Calibrate the display to the finest level with two programmable ISF slots. Based on these specifications, the LM6700 appears just the right blend of high-performance, style and value.. With the exception of the full-array local dimming feature found in the LM9600, this model has everything we look for in a high-end edge-lit LED TV and none of the fluff features that work better for marketing departments than they do for the end-user. It was refreshingly easy to get the LM6700 set up on its stand. Why other manufacturers insist on making this process so complicated, we may never know. Thankfully, LG makes it an eight-screw affair with no acrobatics required. 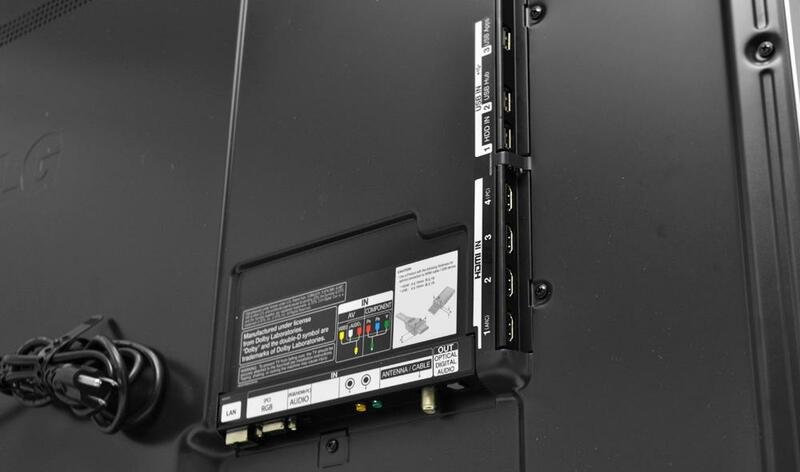 Four screws attach a mounting plate to the display and four more attach a base to the mounting plate’s column. The installed stand is rock-steady and allows for a decent amount of pivot, too. Unfortunately, not everyone will be a fan of LG’s design choice for its TV stands. While certainly functional, the large looping base detracts somewhat from the panel’s minimum bezel and its plastic construction feels cheap in contrast with the TV’s metallic trim. Before evaluating the 55LM6700, we went through the calibration processes outlined in our “how we test televisions” guide. The 55LM6700 looked excellent right out of the box. Calibrating the set starting from the “cinema” preset required very few adjustments. Select changes to the backlight intensity, brightness and contrast controls got us most of the way there. We also nudged the color temperature a notch or two toward the warm side, which seemed to calm down the set’s slightly intense reds and oranges, and opted for the “just scan” option in the TV’s picture size menu so that it would display the full frame of our testing patterns. With these settings adjusted, we found that the 55LM6700 passed most of our benchmark tests with flying colors. Though this TV had a little trouble with one of our deinterlacing tests, it did no worse than any other TV we’ve evaluated and it was able to properly display 24 frame-per-second film content — one of the of the most common failure points with lesser quality TVs. Screen brightness appears to be very uniform. Whereas the Samsung D8000 was clearly brighter toward its edges with a slightly dimmer center, this LG set manages to appear very consistent. Light bleed from the edges is also minimal. There is a strip of slightly brighter picture that runs along the top edge of the TV, but it is barely noticeable at a normal viewing distance and, even then, only when darker colors are being produced in that section of the screen. To see it, you’ve got to get up close and look for it. For that reason, we don’t see this being an issue for most viewers. Technical scrutiny aside, this is a gorgeous-looking TV. We still prefer plasma (and, soon, OLED) for cinema-like motion, but the LM6700 is capable of exceptional brightness, deep black levels and vivid colors that pop off the screen. As it turns out, this is a pretty terrific 3D TV as well. Though LG’s 3D glasses won’t be winning any style awards, they are reasonably comfortable, which is a great start. When we viewed IMAX Under The Sea 3D, there were moments when groups of tiny fish moving at the very center of the screen caused that “cross-eyed” sensation, but otherwise we found the picture to appear remarkably deep. Watching Cloudy with a Chance of Meatballs on this set was an entirely new experience. The images were stunning to behold, not to mention the passive 3D was totally free of flicker and crosstalk. Being able to adjust the 3D intensity was a huge help toward making the experience more comfortable for those of us who generally have a tough time with 3D. The ability to adjust picture settings while in 3D mode was a big bonus as well. With many other 3D sets, picture adjustments are locked out to ensure the set is bright enough. With the LM6700, we found we were able to dial back the backlight a bit for a more natural looking picture that was still plenty bright. As for ease of use, we were generally pleased. The LM6700’s user interface is busy, but navigable — we suppose that’s what you get for having so many content options — but we do want to talk about the Magic Motion remote for a moment. We can see where LG was going with this style of remote (which it introduced in 2010), but there were some aspects we didn’t care for: First, the admittedly comfortable shape of the remote makes it unstable. We found that the remote likes to topple over, even on the flattest surfaces. This may not seem like such a big deal, except that every time the remote moves, the associated cursor (pointer) shows up in the middle of the screen; we found it really annoying. Also, the limited number of control buttons on the remote makes sense considering it is meant to be a point-and-click device, but it won’t be controlling your DVD player or other associated equipment. The TV is worth getting anyway, but we suggest those who prefer a more conventional plan on picking up a universal remote on the side. Finally, we’re pleased to report that, unlike so many ultra-slim TVs on the market, the LM6700 sounds pretty decent. We’d still suggest a sound bar or some other home theater solution — a set this gorgeous just deserves it — but the built-in speakers didn’t make us wince, and that’s a good thing. The downside could be that the speakers are built into an arched enclosure that is tacked on to the back of the TV, which adds depth to an otherwise ultra-slim design. We don’t think this will end up being a big issue, however, since a wall mount will likely push the TV out from the wall by the same measurement. LG has a big winner on its hands with the 55LM6700. Not only is the TV stunning to witness when turned off, it does its job extremely well, particularly considering the challenges that a nearly bezel-less screen design can present. While this set may be the lowest model of LG’s top-tier Cinema Screen TV series, we think it offers an absolutely stellar combination of beautiful form-factor, features and performance and, at just under $2,000 online, is a whale of a deal, to boot.